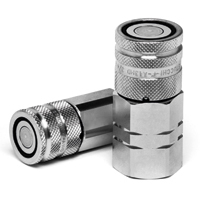 » Connection is allowed with residual pressure of the coupling, with male to drain. » Flat face is easy to clean, reducing the inclusion of contamination inside the hydraulic circuit. » Good resistance at impulse pressures. » Galvanized black body for easy identification.